Matt's Bike Blog: Around The World in 175 Days! Congratulations to James Bowthorpe, who finished his round-the-world cycle ride on Saturday at London's Hyde Park in a new World Record time. 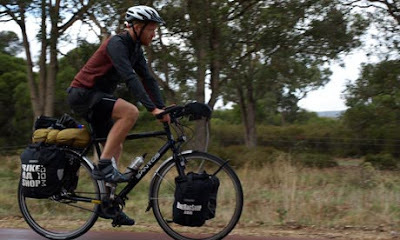 He completed the 18,000-mile journey in 175 days - 19 less than Mark Beaumont last year. The 31-year-old cabinet maker from London averaged over 100 miles a day (wow! ), and had to face an attempted kidnapping in Iran, a bruising encounter with a wombat in Australia, and a sever case of 'Delhi Belly' in India, which saw him lose 20% of his bodyweight. "I'm a bit tired," an under-stated Bowthorpe, told the Independent. "It's been a long six months and I'm just finally relieved to be here – and glad that the world isn't any bigger because I couldn't have done it." I've been following James's progress on Twitter, and a nicer man you couldn't wish to find. Well done James - now have a well-earned rest!